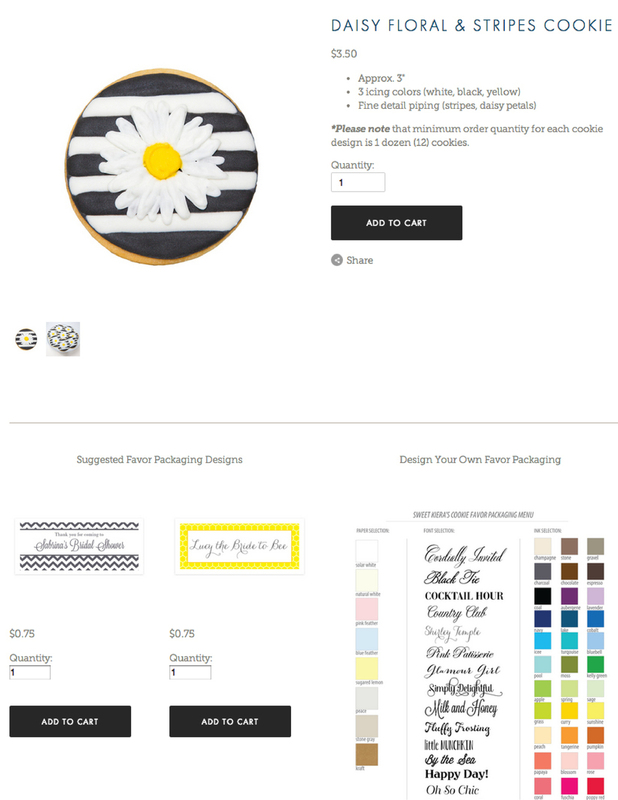 Grand Opening: Sweet Kiera Online Shop and Virtual Tour! I am so excited to announce the grand opening of Sweet Kiera's online shop! I have been working on and dreaming about this online shop for a long time now. 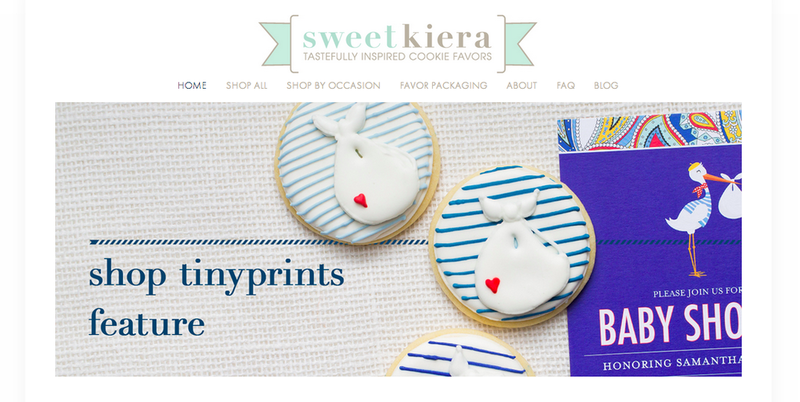 I'm over-the-moon happy to finally launch the store and have my collection of hand-decorated sugar cookie favors available for your shopping pleasure! From the navigation menu bar, you can "Shop All" to see all the available cookies or if you are on a particular mission, you can "shop by occasion" to browse cookies that will work best with your type of event. Let's start with Shop Bridal. Here you will find cookies for engagement parties, bridal showers, bridesmaid gifts, bachelorette parties, wedding rehearsal dinners, welcome gift bags for wedding guests, WEDDINGS... Some cookies have alternate colors to chose from. Cookies with dates or monograms (across the entire shop) can be personalized in an automatically prompted form upon checkout. First comes love, then comes marriage, then comes the Shop Baby collection -- baby shower and christening / baptism cookies. I also have a special Shop Tiny Prints Collection -- these are cookies I designed based on Tiny Prints baby shower invitations. Check out my feature on the Tiny Prints Blog to read more about this! 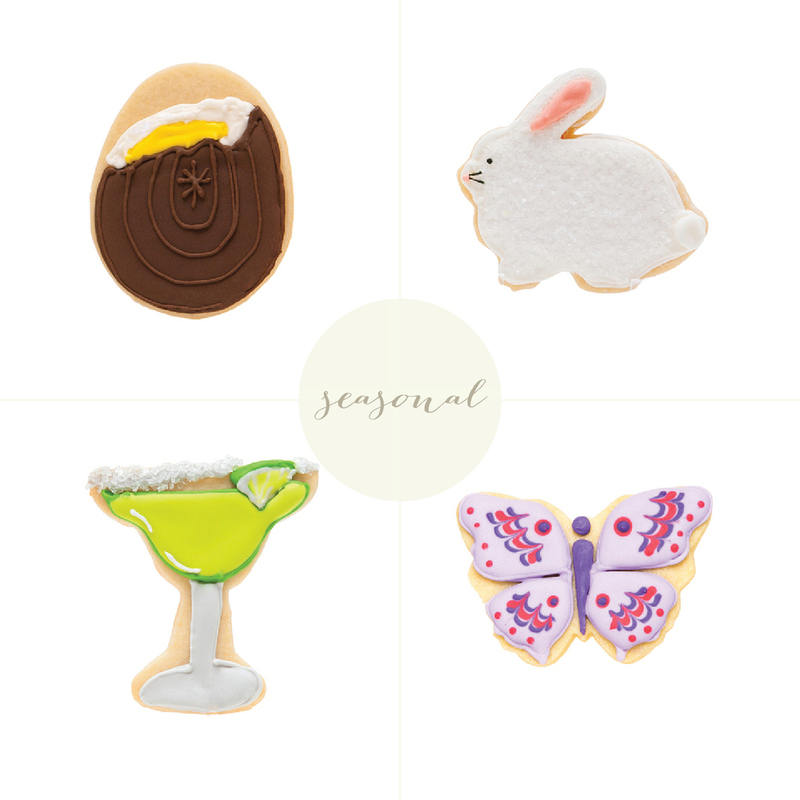 In Shop Seasonal, there are some Easter and Cinco de Mayo cookies to get you ready for Spring. This section of the shop will be updated often so check back regularly or sign up for email updates on the bottom of my home page to be automatically notified when new products are added to the shop or to find out about special deals! Order a Custom Quote and Sketch for something completely unique and tailored to your special occasion. You can even order cookies with a edible printed image (such as a logo or photo) in Shop Corporate. For party perfect presentation, complete your order by adding favor packaging -- chose from a wide collection of pre-designed tags and customize with your own text OR build your own tag using my favor packaging menu. To help you complete the look, I went ahead and suggested 1-2 favor tags for almost every cookie.